Most Star Wars collectors recall receiving carded action figures as children -- those familiar, colorful mainstays of the toy collecting hobby. 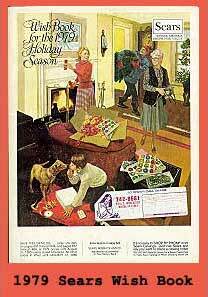 Yet Star Wars figures were not exclusively available on blister cards: They were also sold via the catalogs of larger department stores, who did much of their Christmas business through the mail. Since the mail-order approach entirely dispensed with point-of-purchase attractiveness, most figures purchased in this manner were shipped in plain white or tan boxes. The child receiving one of these packs would open it, wherein he would find his figures sealed safely with their accessories inside of clear plastic bags. Although most mature collectors are aware of these mail-order action figure packs, few have realized just how many were released. In fact, literally hundreds of these packs were issued between 1978 and 1985, and by several different retailers. The purpose of this feature is to document these interesting collectibles, so that collectors who are interested in them can identify what they have, as well as determine what they'd like to find. 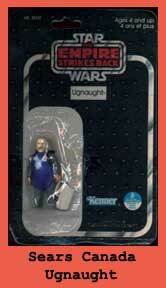 However, this feature does not cover the many premiums that Kenner offered directly to consumers through the mail. Information about these mail-away items can be found here. You'll find that each of the below sections corresponds to a different retailer. There are individual charts dedicated to the mail-order packs issued by Sears, Sears Canada, Montgomery Ward and J.C. Penney. There is also a chart dedicated to the packs known to have been issued by Alden's and Spiegel. This information was obtained through reference to the Christmas catalogs printed by each of these stores during the '70s and '80s. As you can see, J.C. Penney employed several different prefixes; as far as I know, those of the other retailers remained fairly consistent. It should also be pointed out that some packs were issued by two or even three different stores. In such cases, the boxes the figure combinations were shipped in were printed with the catalog numbers of each retailer through which the pack was available. I have only noted such overlaps when multiple box numbers have shown them to exist. Additional overlaps are suggested by the chart information, which often shows similar packs as being offered by different retailers during the same years. Furthermore, some packs were available in multiple years through the same retailer. When this happened, the pack would often retain its distinctive number, even though it was being released in a different year. Box styles for mail-order figure packs varied over the time they were available. 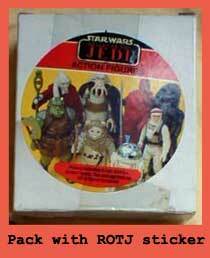 For instance, figure packs issued during the Return of the Jedi era of 1983-1984 were decorated with a generic sticker depicting several ROTJ figures. A sticker affixed to the backs of these boxes listed the actual figures included inside. When speaking of these stickers, it must be pointed out that although they feature an image of a Bib Fortuna figure in a red cape, this variation was not available via the mail-order route. In fact, the red cape Fortuna was used only as a photographic sample, and was never available commercially. 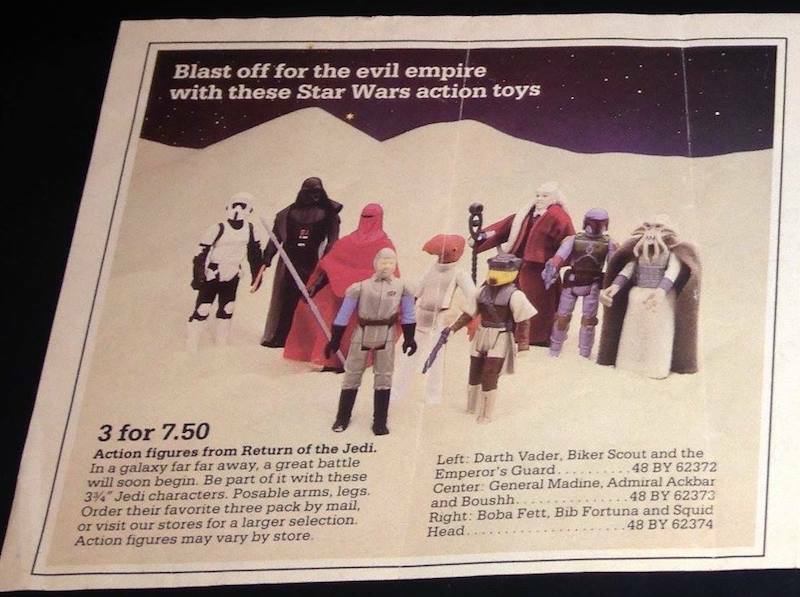 Another important box variation popped up during the early '80s, on packs containing Empire Strikes Back figures. I speak of the mailer packs that are decorated with blue line-art depicting the action figures included inside of them. These graphics were drawn from Kenner repro art books, a resource which the company provided to retailers for their use in designing ads and other promotional materials. Thus far, all the line-art packs I have seen were products of Sears, and all date from 1980. It's possible that these were the only packs to include this type of decoration. Interestingly, some Sears packs from this year have turned up in both decorated and plain white versions, so my grasp on what was and what wasn't released in this format is somewhat unsure. Nevertheless, it's indisputable that the Sears line-art packs are among the most sought after of all mail-order figure packs. It's quite unfortunate that they don't come up for sale more often. Lastly, we must devote some space to the figure packs issued by Sears of Canada, for they are unique in several respects. According to Canadian collector Scott Bradley, the Sears Canada packs issued during the period of 1979 to 1982 bore colorful graphics on their cardboard exteriors, meaning they are much more interesting to look at than their Yankee counterparts. 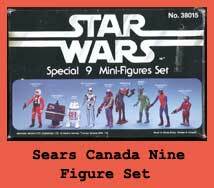 Although very few pre-1980 Canadian packs have been discovered, we know that in 1979 Sears shipped their figure combinations inside of attractive black-and-silver boxes. This was changed during the ESB era of 1980-1982, when the retailer moved to a colorful window box format. It should be noted that none of these packs bear the catalog numbers so common on the U.S. packs. According to Scott, these numbers were affixed to the plain cardboard boxes inside of which the colorful window boxes were packaged for shipping. The figures shipped inside of Sears Canada's mailer packs were not bagged as were those issued in the States. 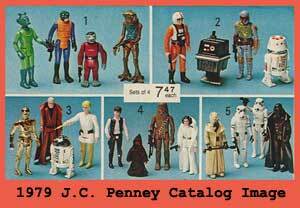 Rather, they were carded, most likely on cards produced by Kenner Canada. 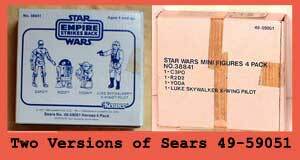 However, during the years of 1980 and 1981, Sears offered one figure in each of their multi-packs that was exclusive to the store at that time. Since no regularly carded versions of these brand new figures were available during the time in which Sears ran this promotion, special packaging was developed for their distribution by the retailer. As one might expect, this packaging was rather bare-bones. The figures were simply shrink-wrapped to the cards, which themselves were about as plain as a package could get, being primarily black in color, with the ESB logo at their tops, the Kenner logo and proof of purchase at their bottoms, and the figure's name in a white rectangle in their upper-middle areas. Speaking of the figures' names, it is well known that several interesting name variations exist with respect to these shrink-wrapped figures. The most famous of these is the notorious "General Veers" version of the AT-AT Commander figure, which was released in 1981. But an R2-D2 "with periscope" (instead of "sensorscope") was also issued in that same year. Additionally, the 1980 Sears Canada Christmas Wishbook refers to their then-exclusive Ugnaught figure as "Tusk from Ugnaught". However, this title does not appear on the figure's card. This sums up our look at this large and often monotonous area of vintage Star Wars action figure collecting. Of course, the bulk of the relevant information regarding mail-order figure packs is contained in the checklists below, so check them out in order to give yourself an idea of what you have, what you're missing and what you might want to start looking for. Contributions were made to this Feature by Andrew Boscardin, Scott Bradley, Mark Clark, Chris Georgoulias, Steven Lynehan, Jim McCallum, John Muse, Ross Nitkin, Chris Stojonowski, Nick Thurn and John Wooten. The vast majority of images come from the collection of James Boryla, who is always looking to expand his collection of mail-order figure packs. James also sells quite a few Star Wars items, and maintains a web site at SWSeller.com. Thanks also to Cloud City Collectibles for contributing a few images. More contributions can surely be made. If you have any information and/or photos to add to the below charts, please e-mail me. Update: June 2018: Well, I finally got around to updating this feature. Special thanks to Shane Carter, Chris Eddleman, Pete Fitzke, Danny Katzel, and Andrew Neo for sharing their collections. When I published this, about 18 years ago, it was the first overview of its kind. Catalog mailers were known by collectors, but they were generally treated as oddball items. Few had a sense of the shape or extent of the category, and misattributions were common. I became interested in this area through collecting catalogs: In obtaining the catalogs of major mail-order retailers, I gradually came to realize that one could document what was out there by obtaining all the catalogs. Being highly suggestible, and perhaps borderline autistic, I attempted to do just that. In 2003, John Kellerman's great book on Star Wars action figures provided a more complete list, and 15 years later collecting catalog mailers is a certifiable thing. No doubt, the grading trend has encouraged that rise to prominence: Encasing these items in acrylic, with all the figures displayed alongside the box, can make a rather mundane item seem downright flashy. The 1982 Alden's catalog duplicates the offerings of the 1981 catalog. This may be an error. As my chart shows, a pack with an Alden's sticker exists whose figures don't match those displayed in the catalog. Alden's stopped producing a holiday catalog after 1982. Therefore, there are no Alden's listings after that year. As far as I know, none of the 1985 packs containing Power of the Force, Droids, or Ewoks figures have surfaced. If one did, it'd presumably contain carded rather than bagged figures. In addition to their holiday offerings, Montgomery Ward is known to have released three packs of three figures to celebrate the 1983 release of Return of the Jedi. These were not present on my original chart, but I've added them for the sake of completeness. They were advertised via a direct-mail flyer, an image from which I've included below. For historical purposes, and because I'm lazy, I've retained the store-specific format of this feature. I realize that this makes tracking the overlap concerning retailer-of-origin hard to grasp. If you want a one-shot view of how the entities that released these packs overlapped, see the Kellerman book. I've tried to account for the overlaps, but there may still be some omissions. Suffice it to say that if a set of figures was released by multiple retailers in the same year, there's a good chance we're talking about the same pack.